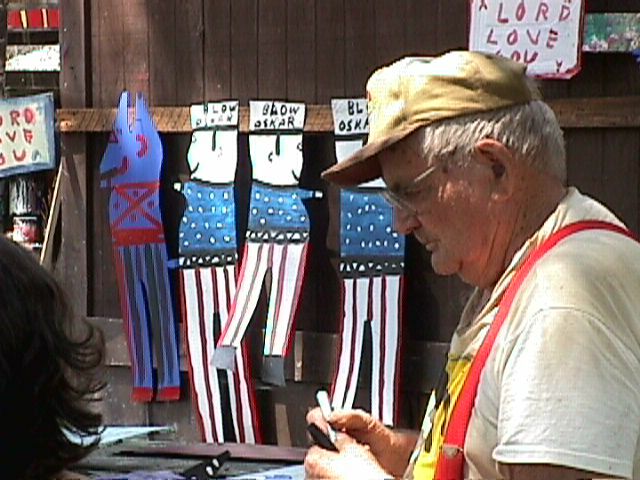 I too made the pilgrimage and visited RA Miller back in the late 1990s, a real treat to visit a legendary Georgia Folk artist - RA Miller. Across Old Cornelia Highway from the Rabbit Town Cafe - "A Real Hoppin Place" on a small rise beside the road you are attracted to a yard full of whirligigs or windmills. This is the home and studio of Georgia folk artist R.A. Miller. As you drive up the gravel road to his home you are greeted by his works of art. They are everywhere, attached to the trees, to the side of his house and on the lawn. 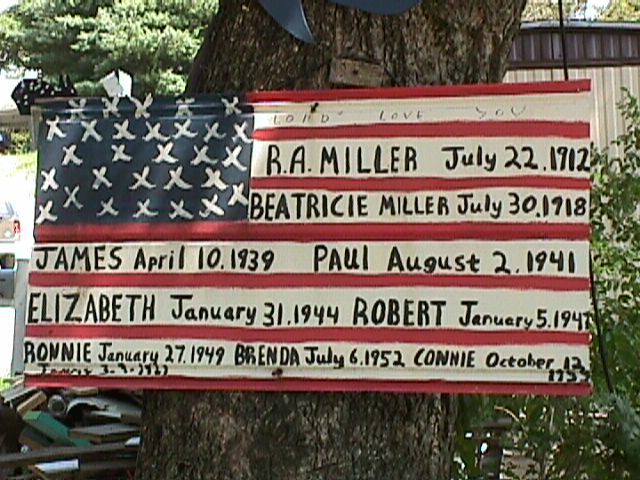 A hand painted tin flag sign proudly displays the names of the nine members of the R.A. Miller family with their birth dates. 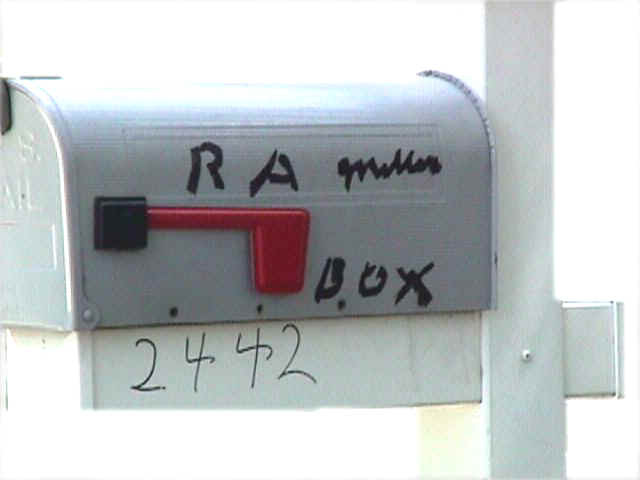 R.A. Miller's birth date is July 22, 1912. The sign also has the name and birth date of his grand daughter that he helped raise. His most popular creations are the tin red devils and patriotic Blow Oskars that you'll find nailed to the sides of his tar-papered house and work shed. Miller's Blow Oskar is named after his cousin, who "used to go up and down the road all the time and blow at me. And his name was Oskar." But fame hasn't much changed the man or his world. Miller, who worked in nearby cotton mills for 30 years and preached some on the side, still lives in the ramshackle house where he was born and where he raised seven children. And he still sells his "junk" for $10-$35, although galleries in Atlanta and New York sell his creatures for 10 times that and more. It appears that the only difference fame has brought is an assembly line of helpers and a steady stream of visitors. Reverend Miller passed away on March 7, 2006 at the age of 93. He will be sorely missed by all who knew him. He leaves a legacy of art behind that delights collectors from all over the world. 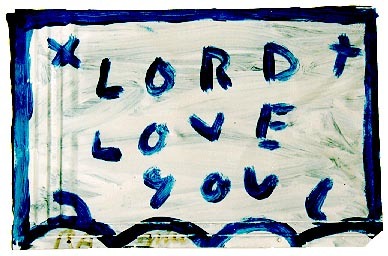 We'll see you on the other side RA, Lord Love You.